You are here: Home / Charlottesville / Government’s not going to do it – so why not Google? Government’s not going to do it – so why not Google? I went to a meeting last week in Old Trail, a new urbanist development in Crozet, Virginia. It took me about ten minutes to ride my bike. What if Google, in addition to driving times, added a “biking” or “estimated walking” time, and highlighted appropriate bike routes? Google has an equal or better chance at influencing public opinion (they’re more credible) than does government (they’re not). I think that might be just an added feature to google, however, I do not feel that it is something that will make or break the company. Sounds like an interesting feature and some people is specific regions would take great pleasure in using. I doubt it would make or break the company, but Google is in a significant position to influence behavior and opinion. By putting it in front of searchers as an option, I’d bet more would at last think about biking as an option. I remember visiting Uppsala, Sweden as a child and one of the neatest experiences I had was when my friends and I rode bikes to the recreational center and all the parents drove. We got to our destination way before our parents did because we were able to take a very direct bike route that cut through parks. It’s more convenient in Uppsala to ride a bike than it is to drive – it is a really neat town that perhaps could serve as a model for future biking/walking in urban planning and design. The group ACCT in C-ville is doing great work to develop and publicize safe cycling routes around town. The city council sees the need for safe bike routes and has been very supportive. Unfortunately, it is going to take gas going up a few more dollars per gallon for more people to realize cycling is a great mode of transportation for traveling around the city. 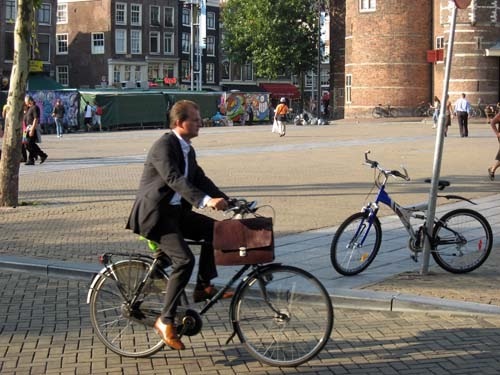 I have noticed an increase in city cyclists recently, though. I’m almost convinced we are at a tipping point.